The Beijing Summer Olympic Games are long since over, and the vortex of criticism, demonstrations, ceremonies, pollution concerns, acclaim and gold medals that swirled around China for months has subsided. In the process China’s world image was changed. By deftly using the games to draw a symbolic line between its past and what the world must hope will be a brighter future, China managed to project itself globally as a nation reborn from poverty, war, revolution and self-inflicted catastrophe and to rebrand itself as an emerging superpower approaching fuqiang (wealth and power). If China has finally managed to escape much of its old stereotype, what else remains for it to do during the next stage of its incomplete Long March? Ever since the arrival on the south China coast of superior British gunboats in the mid-nineteenth century, Chinese intellectuals and leaders have had to struggle with the challenge of their country’s weakness and the question of how to restore it to a state of fuqiang. This quest gained more urgency as the West forced China to sign a series of unequal treaties. China reached a nadir of self-confidence after imperial Japan defeated the Qing Dynasty in the Sino-Japanese War of 1895 and went on in the 1930s and ’40s to occupy large portions of China. Japan was part of the sorry process of foreign powers guafen (slicing up China like a melon). During the twentieth century, this yearning to see China regain stature and respect became an almost obsessional leitmotif in political thought. Indeed, the state of humiliating defenselessness to which China had been reduced was one of the motor forces driving Mao’s extremist revolution. Beneath all the ideology and turmoil Mao engendered, what even he sought was a new socialist fuqiang–or at least a simulacrum of such wealth and power–as a way to re-imbue the Chinese people with a sense of pride in their country. Despite his egomaniacal destructiveness, he did recognize their thirst to see China restored to centrality and greatness. Having sidelined Mao and all he propounded, China has nearly “reunified the Motherland” (with Hong Kong and Macao returned and only Taiwan still aloof), enjoyed almost two decades of 10 percent annual growth in GDP, become one of the world’s most dynamic trading partners, modernized its military significantly, launched an ambitious space program and hosted a largely triumphant Olympic Games. It has not only reached a major milestone in its century-and-a-half hegira from poverty and weakness to wealth and power; it has also managed to relaunch itself before the world in one of the most spectacular public relations campaigns in history. Yet, missing from the Chinese government’s new portfolio of accomplishments is moral authority. China, replete with human rights abuses at home and allied with many of the world’s unsavory regimes abroad–from Gen. Than Schwe in Burma and Kim Jong Il in North Korea to Omar al-Bashir in Sudan and Robert Mugabe in Zimbabwe–needs an ethical rebirth to accompany its economic one. Unfortunately, its old Marxist-Leninist canon is thoroughly inadequate to the task of inspiring a truly modern, open and prosperous China. Fortunately, the Chinese have indigenous sources for regeneration of a more principled and ethical form of statecraft. Indeed, they possess an enormously rich classical tradition from which it is possible to imagine leaders extracting the basis for a new and more morally convincing, although probably not completely democratic, form of governance. What’s more, President Hu Jintao and Premier Wen Jiabao have already begun to tap into this aquifer of tradition for elements–perhaps it would be more accurate to call them glosses–of their evolving notions of statecraft. The most demonstrable manifestation of this interest came in a new emphasis on the importance of the Confucian idea of he (harmony) in a stable society. Although Mao had been irrevocably dedicated to emphasizing social contradictions and class struggle–famously declaring that “a revolution is not a dinner party” but “an insurrection, an act of violence by which one class overthrows another”–Hu suddenly began stressing the far more pacific goal of harmonizing conflicting groups in Chinese society. As soon as Hu uttered the words “harmonious society,” hexie shehui, the new slogan went viral. In March 2007 Premier Wen proclaimed, “From Sun Yat-sen to Confucius, the traditional culture of the Chinese nation has numerous precious elements.” All over China, party cadres began jumping on the harmony bandwagon, so that soon almost any idea, article, conference, theory or project could win favor simply by being introduced by and joined with this new, almost sacred mantra. It was a reminder that, in China, Big Leader culture was still far from dead! Even the celebrated filmmaker and director of the opening ceremonies at the Beijing Olympic Games, Zhang Yimou, found the siren song of this slogan irresistible. As all the world saw on television, Zhang emblazoned the harmony character he on a dancing tile as part of an animated mosaic that rivaled Las Vegas for choreographic extravagance (although Tibetans might have been excused for wondering how they fit into this almost orgiastic celebration of “harmony”). Confucius believed that moral power would come from the study of the classics and an understanding of the deportment of the ancient sage kings, whom he venerated. “He who rules by virtue is like the polestar, which is unmoving in the firmament while all other stars revolve respectfully around it,” he said. In many ways, the Confucian prescription for ethical behavior as the basis of wise rule was akin to the humanism espoused by French Enlightenment thinkers. Unlike Maoism, which believed in class-based rather than universal values, Confucian and Enlightenment thinkers held that there were innate, universal virtues and rights embodied by all human beings. “Never for a moment does a junzi part from humanity. He clings to it through trials, he clings to it through tribulations,” declared Confucius. Beijing’s current leaders seem to have sensed the moral vacuum into which Chinese politics has fallen. 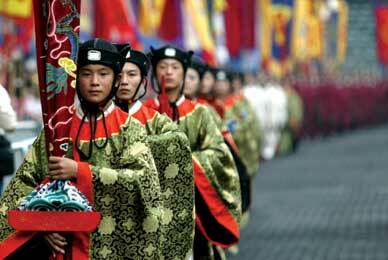 They have also evinced a readiness to look to China’s past rather than the outside world for remedies. After all, Confucianism is uniquely Chinese and already coded into China’s cultural DNA, whereas the adoption of any Western political theory, especially democracy, would come freighted with imputations of surrender to foreignism. By emphasizing the soft power of moral suasion rather than the hard power of coercive authority, Confucianism’s idealism was admittedly not always up to the task of providing an effective ideology for hard-nosed leadership, especially during times of trouble and disunity. It was not surprising, then, that ancient China also gave birth to other very different schools of political thought. One of these was Legalism, or fajia, which by emphasizing centralized state power, strong leadership, strict laws and harsh punishment for offenders was the antithesis of Confucianism. Instead of viewing human beings as essentially good and thus subject to influence by moral example, Legalists viewed them as basically craven. Consequently, they viewed as naïve any leader who put faith in moral suasion as a way of keeping order among unruly humans. Instead of platitudes about virtue, Legalists put their trust in laws, a strict system of rewards and punishments, fear and repression. Legalists had no interest in the “transformative power” of exemplary rulers humanely governing through manifestations of Confucian virtue. For them, such talk was just vain philosophizing. The smart leader, wrote Han Fei, the third-century BC philosopher who became Legalism’s best-known exponent, “does not speak about deeds of humanity and righteousness, and he does not listen to the words of learned men.” By “learned men,” Han Fei meant the likes of Confucian junzi. The Legalist school of statecraft became the inspiration for China’s first unifier and emperor, Qinshi Huang, whose tomb contained the well-known army of protective terra cotta soldiers, symbols of his fixation on constabulary power–even for the afterlife. Such an amoral conception of statecraft was the antithesis of Confucius’s moralism. As Confucius scornfully observed, “Whereas the superior man comprehends yi (righteousness), the small man only comprehends li (profit).” Confucians had only contempt for what the celebrated Harvard intellectual historian Benjamin Schwartz, in his marvelous book In Search of Wealth and Power: Yen Fu and the West, described as the “brutal and callous ‘wealth and power’ philosophy” of Legalism. Although other schools of thought, such as Buddhism and Taoism, also developed in ancient China, Legalism and Confucianism were far more down-to-earth, so they came to have a special yin/yang relationship, each waxing and waning in influence during different dynasties and imperial reigns. The result was that this interaction gave imperial governance a mix of ethical legitimacy and political realism, imbuing Chinese statecraft with a certain hybrid vigor. The past six decades of socialist-driven, followed by market-driven, autocracy have leaned more heavily for inspiration on Han Fei and the Legalists than on the Confucianists. Leninist revolutionaries like Mao were fascinated by Qinshi Huang; Marxist-Leninist-Mao Zedong Thought, which seemed like the quickest way to catalyze China from war and chaos to “wealth and power,” borrowed many elements from Legalism. But now, as attainment of China’s quest for centrality and respect, as well as fuqiang, seems close at hand, leaders find themselves at a critical juncture. China, having impressed the world with its economic development, enters the next chapter of its odyssey to great nation status, which will require it to diversify its portfolio of goals to include all the elements that make for true national greatness. In China’s case, moral authority is one of the most important, and still elusive, ingredients. This lacuna will become increasingly evident for Beijing’s leaders. A way forward would be for them to start acting more out of China’s Confucian, rather than its Legalist, tradition. Indeed, with the Chinese government setting up Confucius institutes around the world, TV shows explaining and extolling the teachings of the Sage and one scholar calling for a Confucian Socialist Republic in China, it seems that something of a moment has arrived. It may seem gratuitous, even hypocritical, for an American–particularly at this moment in history–to make judgments about the moral failings of another country, like China. But the question of moral authority is something with which Americans have had no small acquaintance. With historical pretensions to being the shining “city upon the hill,” the United States has sometimes possessed impressive powers of moral suasion, as large a quotient as any other modern nation. However, during the past decade Americans have seen their moral stature melt away before their eyes. So on this vexing issue, America and China find themselves, paradoxically, in something of a state of parity. Whether Hu Jintao or Wen Jiabao, both of whom have an affection for the Chinese classics, can become latter-day junzi by borrowing from Confucianism; whether some kind of meaningful neo-Confucian revival of ethical values can be exhumed from the graveyard to which Mao’s revolution consigned almost all traditional Chinese culture–much less be grafted onto the crypto-Marxist/Leninist/capitalist system of China’s one-party rule–is uncertain. But China’s current attention to Confucianism suggests that the Chinese themselves have begun to feel the moral void from which their government operates. So as China looks back on the Olympic Games and as the United States looks toward an election, the two countries find themselves arriving at similar places, albeit by different routes. Both are challenged to rediscover in their traditions wellsprings of moral authority capable of fortifying their funds of fuqiang–their economic, military and diplomatic might–along with the other subtle but absolutely essential element of true greatness.